LSU came very close to making it a clean sweep of Louisiana for its 2019 football recruiting class. According to coach Ed Orgeron, the Tigers offered scholarships to 11 players from the home state. LSU was on the verge of going 11-for-11 until defensive lineman Ishmael Sopsher of Amite picked Alabama on Wednesday afternoon. Still, the six players who signed with the Tigers on Wednesday pleased Orgeron, whose second full recruiting class ended the day as No. 5 in the country. Two of LSU’s six newcomers are from Louisiana – wide receiver Devonta Lee of Amite and tight end Ray Parker of Ruston. There was one junior college transfer – defensive end Soni Fonua. There were three out-of-state high school signees – outside linebacker Desmond Little from Prichard (Ala.), cornerback Jay Ward from Moultrie (Ga.) and safety Maurice Hampton of Arlington (Tenn.). Both Little and Ward had been on hold depending upon the availability of scholarships. Orgeron did not mention Sopsher by name, but his tone changed when talking about players who got away. “I don’t worry about the guys we don’t get,” Orgeron said. “We gave it all we can. We did the recruiting the right way as well as we could do it. Parker and Hampton were committed to LSU before the December signing period, but neither signed at that time. There are some academic issues with Parker, while the Tigers will have to worry about major league baseball with Hampton. It appears that Lee and Fonua were the best players signed by LSU on Wednesday. Lee was a wide receiver on Amite’s state championship team. Fonua, who played at Mesa (Az.) Community college, is expected to be an impact pass rusher next season. Little and Ward were in the Tigers’ recruiting bullpen. Both players wanted to come to LSU, but there had to be available scholarships. 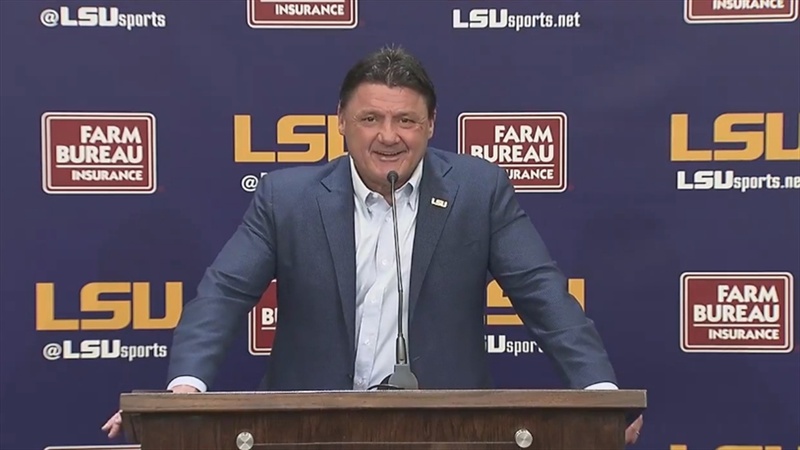 “We went after four defensive linemen who went to other places,” Orgeron said. “Little is a diamond in the rough. He was a silent commitment to us a long time ago. He could be like Arden Key or (Barkevious) KeKe Mingo. We need a little better edge rushers. Orgeron is not holding any scholarship for graduate transfers as he did a year ago. LSU came away with three graduate transfers in 2018 – quarterback Joe Burrow, defensive back Terrence Alexander and kicker Cole Tracy. Of those three, only Tracy made an early decision to join the Tigers. Coming away with the fifth best recruiting class in the country is quite impressive. However, three of the four schools ahead of LSU reside in the Southeastern Conference – Alabama at No. 1, Georgia at No. 2 and Texas A&M at No. 4.